Drinking fountains at Edgar P. Harney Spirit of Excellence Academy. 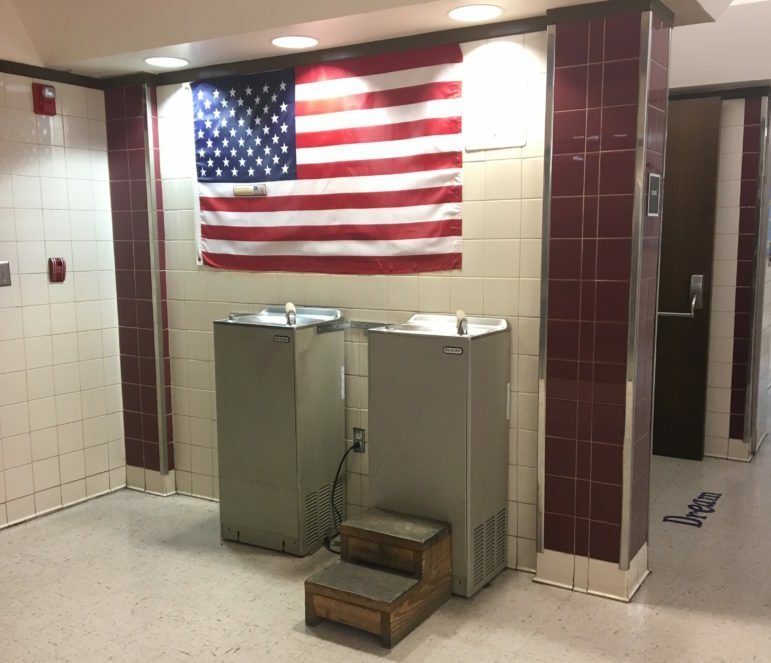 The Orleans Parish School Board has cleared the way for filters that remove lead from drinking water fountains at schools throughout the district, but not from kitchen sinks. In a unanimous vote at its Thursday night meeting, the board approved a bid from EcoWater Systems. The Minnesota-based company must start installing filters within six weeks of inking a contract, which hasn’t happened yet. Most schools start summer break in about a month. Installation will likely continue into the summer, according to a school district administrator. The project, a long time coming, does not include kitchen sinks as the district had wanted. That’s because the bidding companies didn’t meet the district’s requirements for those installations — again. Nearly two years ago, in the aftermath of Flint, Michigan’s lead-in-water fiasco, the two agencies that authorize the majority of Orleans public schools — the OPSB and the state-run Recovery School District — announced they would test school drinking water for lead. That never happened. The Orleans Parish School Board doesn’t know if its school water supplies have a problem with lead, a toxin that can cause brain damage and behavioral problems. It appears that the last time school water was tested was shortly after the federal Lead Contamination Control Act became law in 1988. At the time, at least two fountains in an administrative office were shut off because they were suspected of delivering lead-contaminated water. After recent discussion of testing school water, the district decided instead to install water filters. That decision came after the Sewerage and Water Board of New Orleans argued that school officials should set a higher threshold of lead before taking drinking fountains out of use. Experts also said that even negative tests wouldn’t guarantee that the water would remain safe because road construction and other factors can raise the amount of lead in supply lines. Sometime early last year, the district decided to skip the testing and proceed to installation of the filters, which are certified to remove more than 99 percent of lead. In 2016, the day Michigan officials were served criminal indictments in that state’s water contamination crisis, local school districts announced they would “proactively” test school water for lead. They hired a contractor to create a testing plan. Louisiana law says any facility where children are cared for, including daycare centers, must be “maintained free of lead contamination.” That includes paint, soil and water. The law doesn’t appear to require water tests. But the U.S. Environmental Protection Agency “strongly recommends” schools perform such tests. In August 2016, then-Recovery School District Superintendent Patrick Dobard alerted the city’s water agency to its plans. Vincent Fouchi Jr., the water agency’s chief of operations, wrote back. “We have a vested interest in ensuring that your lead testing program is successful, and that the data generated from your program is accurate and representative,” Fouchi wrote. He wanted to collect duplicate samples to analyze. Others at the water board agreed. The agency wanted the district to use a higher threshold, 20 parts per billion, in line with the EPA’s guidelines for testing in schools. That was twice what the districts had planned to use. The districts settled on 15 ppb, according to documents. Both are higher than 1 part per billion, which is the level at which the American Academy of Pediatrics recommends shutting off a school drinking fountain. The testing consultant worried that dueling test results could create problems. Experts agreed filters were a more surefire way to prevent lead exposure. School district leaders decided sometime in late 2016 or early 2017 to install filters, and the Orleans Parish School Board called for bids last summer. After The Lens first reported on the decision to bypass testing and install filters, the two school districts told school leaders the filters would be installed last fall. The initial bids from two companies were opened in September. EcoWater was tentatively chosen, only to be disqualified along with the losing bidder because their systems weren’t certified to filter microbes, a source of biological contamination. The district wanted that added filtration so schools can stay open during boil-water advisories. The second round of bids was opened in January. In February, the district again tentatively chose EcoWater, but only for the drinking-fountain filters. The district also wants filters installed where the water supply enters each school kitchen. The item didn’t appear on a board agenda until last week, when it was approved by a committee and the full board. The three-filter system will cost $624 per drinking fountain. Chief Operating Officer Eric Seling said the district estimates each school has eight to 10 drinking fountains on average. “We’re looking at $500,000,” he told board members at a committee meeting Tuesday. That figure is under the $800,000 the board approved for the project. But it doesn’t include kitchen filters, which could cost more than those for drinking fountains. The school district has said it would test the filters after installation to be sure they are working.